Can you say "Fight of the Year"? Paul Williams and Sergio Martinez gave everything they had, and then some more, in front of a ecstatic crowd in Atlantic City, NJ. If you had to sum up this fight in a few words, you could say both fighters showed tremendous heart and courage, with Williams being the busier fighter and Martinez landing the harder shots. 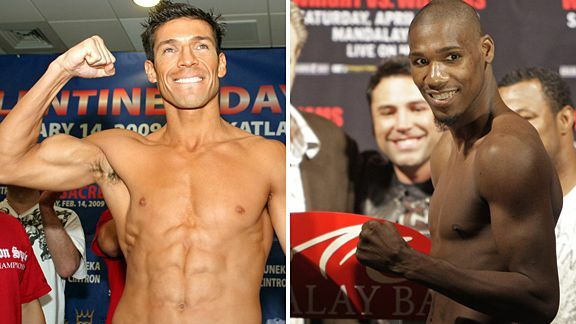 From the opening bell, Paul Williams and Sergio Martinez fought at a rapid pace. Early in the 1st round, Martinez connected with a solid right hook, but Williams took the punch well. Then, Williams knocked Martinez down with a grazing straight left to the head. Martinez appeared to be slightly off-balanced as Williams landed the punch. After he got up, Martinez rocked Williams with a hard, straight left. Next, Martinez sent Williams down and into the ropes with a powerful right hook just as the 1st round was coming to an end. Martinez continued to fight soundly in the 2nd round, stunning Williams again with a right hook off of his right jab. Martinez also connected with a left uppercut to the body. Williams was more aggressive in the 3rd round, hitting Martinez with right jabs and straight lefts. Martinez took the punches and fired back a right hook and straight left combination. After that, Williams struck Martinez with another straight left. As the 4th round began, Williams was stunned again when Martinez hit him with consecutive straight lefts. Next, Williams landed a thunderous right hook to Martinez's head. Martinez took the shot and threw his right jab. Martinez snapped Williams' head back with a right hook-straight left combination. Williams showed a good chin and hit Martinez back with a straight left. Following that exchange, Williams hit Martinez with another vigorous left hand. Williams landed a right hook-straight left combination to start the 5th round, but Martinez would counter back yet again. This time, Martinez connected with a violent straight left that stunned Williams. Somehow, Williams took another rock-solid punch from Martinez and came back with right hooks and straight lefts. The fight would continue at this pace through rounds 6 and 7. Moving into the 8th round, Williams landed a straight left, but Martinez started to attack the body frequently. He landed some fierce, straight lefts to Williams' right side. A right hook to the head sent Williams back. Martinez continually hammered Williams with flush, straight lefts to the head and body in the 10th round. Williams was busy and kept coming forward, throwing his right jab. He landed a grueling right hook to Martinez's head. Martinez would start fast in the 11th, connecting with straight lefts and a right hook. Throughout the fight, Martinez hit Williams flush with the right hook. Williams never made an adjustment. As the bell rang to begin the 12th round, Williams ran across the ring and fired a straight left. In close range, Martinez got in another straight left to the body. Subsequently, Williams came back again, connecting with a left uppercut and followed it with a right hook. Finally, Williams landed a straight left-right hook combination. Julie Lederman scored the bout a draw at 114-114. Lynne Carter scored it 115-113 for Williams. Both of these scores were reasonable. However, Pierre Benoist scored the bout 119-110 for Williams. There is absolutely no possible way that anyone could rationally argue that Martinez only won one round. Was Pierre Benoist trying to make a mockery of boxing in this potential "fight of the year" match up? It taints Paul Williams' victory tonight. Julie Lederman resides in New York, while Pierre Benoist and Lynne Carter are from New Jersey. This fight was very difficult to score. I thought Williams was busy and at times, forced the fight more. However, Martinez delivered the harder blows and landed the cleaner shots. Both men absorbed harsh punishment from each other throughout the 12 rounds. I scored it 116-115 for Martinez. I had rounds 1, 9 and 12 even. With the victory, Paul Williams improves his record to 38-1, 27 KO's. Martinez drops to 44-2-2, 24 KO's. Anyone want to see Williams-Martinez II in 2010? In a rugged toe-to-toe battle, Chris Arreola scored a 4th round knockout over Brian Minto. Both fighters were able to connect with many flush right hands throughout the bout. In the 1st round, Minto hit Arreola with a right hand that landed just over Arreola's jab. Arreola countered with an overhand right. At that moment, Minto nailed Arreola with a left hook-overhand right combination. Overall, Arreola utilized the jab better during the round. Minto struck Arreola with a clean, right uppercut in the 2nd round. Arreola fired back with an overhand right. Minto was successful going to the body. Arreola connected with a hard left hook, but Minto showed he could take a solid punch. Then, Minto nailed Arreola with an overhand right. Arreola landed another right that caused swelling to appear under Minto's left eye when the round ended. Stay pretty with MMA headgear. As he did in the 1st round, Arreola started to work his jab again. Early in the 3rd round, both guys connected with right hand shots. The action in the 4th round intensified when Arreola hammered and dropped Minto with a left hook-overhand right combination. Both guys were unleashing their shots at the same time, but Arreola's got to the target quicker. Minto got back to his feet and continued to fight hard. He landed a right, but Arreola hit him again with his right. Minto started to walk right into Arreola's overhand right, which is his best punch. Arreola put Minto down again with another left hook-right hand combination. This time, referee Eddie Cotton counted to ten and the fight was over. Arreola bounced back nicely following his hard fought loss to Vitali Klitschko. Yesterday, Arreola weighed 263 lbs. If Arreola can control his weight issues better, he may be able to have more of an impact in the heavyweight division. Chris Arreola improves his record to 28-1, 25 KO's. Brian Minto's record now stands at 34-3, 21 KO's.